THE SWIMMER: Prelude To The Movie-Brat Flood – Schlockmania! The “movie brat” generation of filmmakers took Hollywood by storm at the dawn of the ’70s, opening the door to a more mature version of major studio filmmaking that would change the film business for good. That said, they didn’t do it alone. There were gifted filmmakers who were working inside the major studio machine during the ’60s, pushing it in more daring directions with films like The Pawnbroker, Who’s Afraid Of Virginia Woolf? and Seconds, to name a few. Frank Perry was one of those filmmakers, a talent who hit the scene with films like David And Lisa and Ladybug Ladybug during the first half of the ’60s. In 1968 – one year before Easy Rider hit movie screens and officially kicked off the “movie brat’ era – Columbia Pictures released Perry’s film The Swimmer. Despite its major studio status and the presence of old school Hollywood star Burt Lancaster in the title role, this film is every bit as artistically and thematically daring as any of the movie brat directors’ films. Like many of Perry’s best films, The Swimmer is driven by a screenplay penned by the director’s then-wife, Eleanor Perry. It was adapted from a story by John Cheever and tells the story of Ned Merrill (Lancaster), an aging businessman who takes pride in his family and lifestyle. While enjoying a dip in the pool at a friend’s house, he realizes that a series of pools stretches across the suburban neighborhood, leading back to his own home. He impulsively decides that he will “swim” his way back home, greeting all the old friends along the way. However, the trip is not as smooth as Ned believes it will be. Despite the neatly manicured lawns and beautiful pools, this sunny landscape harbors some lonely people and broken dreams. As his trip progresses, Ned discovers that his vision of himself and their lives doesn’t always match up with those of the people he meets. He also realizes he’s not as tough or universally charming as he believes himself to be – and when he finally reaches his home, he might not like what is waiting there. 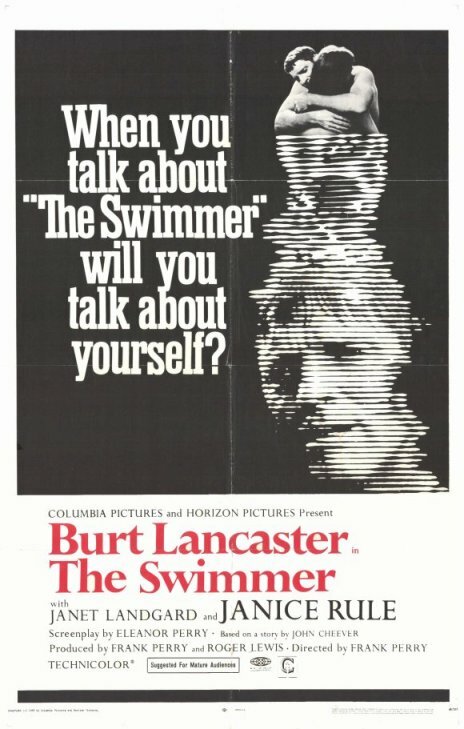 The Swimmer is one of the most emotionally overpowering dramas produced by a Hollywood studio during the ’60s – and like the somewhat similar Who’s Afraid Of Virginia Woolf?, it derives its searing power from a good script, strong performances and inventive direction. Eleanor Perry’s screenplay is richly layered but never strains for effect. Her dialogue hits the right mixture of recognizable conversational rhythms and stylization, keeping the narrative on its feet, and the characterizations are always vivid and memorable, even with the one-scene characters. The plotting gives the illusion of being episodic at first but it eventually becomes apparent that every event is carefully calibrated to achieve a cumulative effect – and the film’s third act delivers a series of scenes that will rock the audience back on its heels, paying off all the audience’s questions about Ned and his life in a devastating way. The performances carry the demanding script along with confidence. Lancaster famously considered this film his best work and it isn’t difficult to see why. His character drives the film, appearing in almost every scene, and allowed him to apply his leading-man charm to a demanding, surprisingly subversive role. Frank Perry got a powerful sense of ironic effect by casting Lancaster in a role that is essentially a brutal critique of the American Dream’s self-deceiving failure and Lancaster gives his all, covering a memorable breadth and depth of emotions as the film’s drama intensifies. Better yet, Lancaster is a backed up by an array of rich supporting performances. Janet Landgard cuts a striking figure as a doe-eyed youngster that Ned flirts with during his journey and Kim Hunter supplies a warm, welcoming turn as a friend’s wife who represents a path that Ned could have but did not take in his life. Dolph Sweet has a few memorable scenes as a nouveau riche neighbor who presides over his party with a menacing sense of faux-bonhomie. That said, the best of the supporting turns comes from Janice Rule as a gorgeous neighbor who icy demeanor hides a painful, shared past with Ned. Her scene is one of the most crucial in the film, truly revealing the film’s protagonist, and she creates fireworks with Lancaster in a unforgettable standoff. Frank Perry’s direction seals the film’s powerful effect. Though the film is essentially a drama driven by dialogue, he manages to bring kinetic, emotionally intense touch to it with an ambitious but controlled barrage of stylistic touches. He conducts his story with expressive camerawork – cranes, handheld work, slow motion – and this gives the film an unexpected visual complexity. Making the film was apparently quite difficult for Perry – he had disagreements with Lancaster, producer Sam Spiegel fired him during post-production and Sydney Pollack directed four new scenes, including the famous one with Janice Rule. That said, his vision is undimmed in the final product. 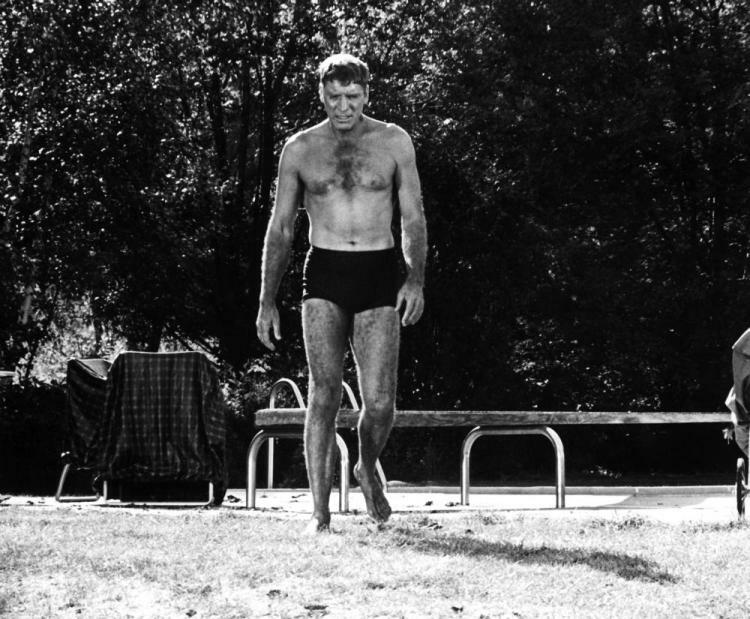 Perry specialized in showing the dark heart buried under the pretty surface of suburbia long before it became a cynical filmmaking cliché and his treatment of that theme in The Swimmer has lost none of its white-hot power in the decades that followed. If you’re interested in seeing the films that laid the groundwork for the movie brat conquest of Hollywood, The Swimmer should be high on your viewing list.